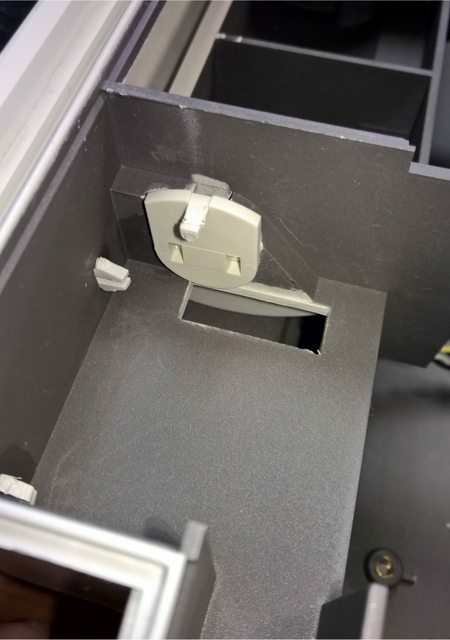 can anyone tell me what is there supposed to exist in this place so the drives cover stays up? any ideas how to replace it ? Last edited by keropi on Mon Apr 15, 2019 3:08 pm, edited 1 time in total. Re: RiscPC600 sliding cover mechanism? thanks for this! looks like a nice way to fix it - assuming I can find a good spring. So all there was in there originally was a spring connecting the "flap hook" and some broken anchor point on that rectangular hole? I thought there was a mechanism to keep the cover up, do I understand correctly that the cover always wants to go up and you are supposed to hold it down while switching disks? I've repaired a few of my RiscPCs with this issue. The spring needs to be fairly strong and about 1-2cm long when coiled. It should stay in place when opened if you do the repair properly. It only really springs closed when the cover is near the top. Last edited by RobC on Mon Apr 15, 2019 5:36 pm, edited 1 time in total. I've seen it done with a cable-tie through a hole in a similar place to attach a spring. To be honest, I've just made a small hole behind the gap and hooked the spring through there but that was the first one that came to hand. I've used pliers to bend the eye over the rectangular cut-out once it's screwed in place to ensure that the anchor point is roughly where it should be. Haven't always done this though - it has depended on the size of the spring.